This new year, you might be looking for strategies to increase your sales, and every one know that if you need to sell more products, you need more people to a.) find you and b.) know about what you’re selling. When you cross these two hurdles, (believe me, this is no mean feat in Nigeria), then you can now face the task of convincing customers to give you their money. When you create an online store, you effectively open up your goods to not just people walking by in front of your physical store, but now to people who are looking for your products while on their phones in their offices, toilets, hairdressers etc. While this is a new channel, you still need a & b above. You still need customers to find you and know what you’re selling. Konga.com, one of Nigeria’s largest online malls launched its marketplace platform in 2014, and opened it up to independent sellers. Instead of Konga.com buying and distributing it’s own products, it decided to open up its warehouses to independent sellers, and find customers for their products through the website, effectively solving Problem A and B. Konga.com helps buyers find what their looking for, and connects them to the sellers who have the products in stock. Sellers in every part of the nation can profit from Konga’s brand quality, customer base, delivery services, etc and offer buyer an enhanced shopping experience. According to Sim Shagaya in a 2015 Forbes interview, he stated that in 2014, Konga closed with 8,000 merchants on their online marketplace. So, why would any seller want to own a store on Konga.com? Kongas seller program is open to sellers from all over Nigeria, as opposed to just Lagos. This means that you can sell on the platform regardless of where you are based. On the other hand, sellers can also reach customers from all over the country regardless of where they are based. This means that prices are competitive, and there’s less likelihood of being ripped off. Complete the four stage registration process and wait for your store to be approved. Ensure that your email, home/store address and phone numbers are correct to avoid sign up and order fulfilment errors;. Also, you will be required to enter your account details for payments. Ensure that your product title is well described, and your content description is detailed. Customers do not have the opportunity to touch and feel your products, so you need to eliminate the chances of them guessing (and losing hope in you) by providing as much information as possible. Images of your product, as well as the product descriptions as the closest customers will get to touching your products, so put some effort in this. Invest in high resolution images, and try and get as close to a 360ᶱ view as you can. If this would be too time consuming, outsource this task to a good photo studio. It goes without saying that you should ensure your products are of high quality. There’s no point in providing high quality images and fantastic product descriptions if the products themselves are rubbish. Put some effort into your delivery packaging. Well packaged good evoke excitement. Deliver on time. There is no point in sending out very high quality products to your customers, only to exasperate them with your agonising delivery times. They will insult you on Twitter and call you a scammer. Customer service. If things go wrong (as they are bound to), ensure you’re there to put things right. 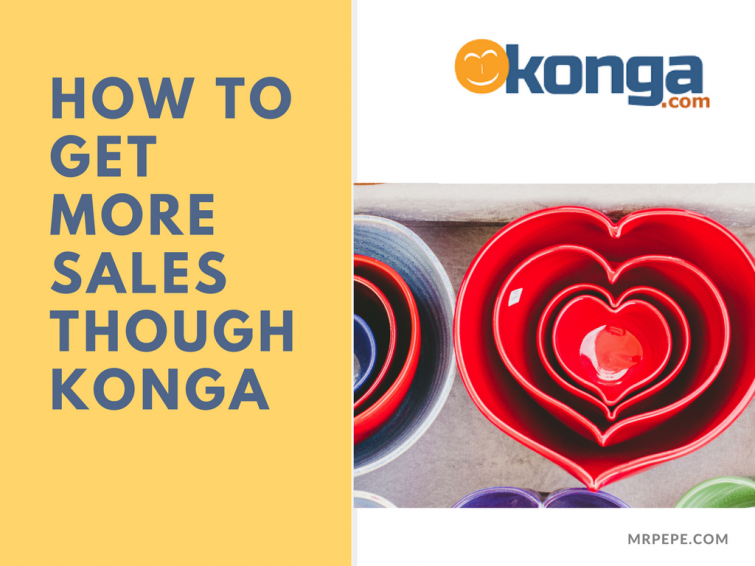 How much does it cost to sell on Konga.com? These are monthly membership fees required for access to the platform. After signing up, you will be required to pay this fee to sell on the platform. There are 2 plans – A Silver plan costing N1,000 monthly which allows you to list up to 10 items each month, or a Gold plan which allows you to list an unlimited number of items monthly, and which costs N2,500 monthly. After registration and store verification, you will be sent an access link to the SellerHQ platform. Log in to access your dashboard, edit settings and begin product listings. You are allowed to upload 5 images (500px X 500px) of each product, a well detailed title, description, price and VAT. The product goes live on the site after Konga’s quality approval and review. Handling your first sale properly is very important. When a customer buys your item on the site, Konga confirms the customer’s details and sends you a notification on your dashboard, and you have 24 hours to accept or decline the order fulfilment. After accepting the order, click on orders on your dashboard to print order summary and invoice, package the order neatly and ship. Shipping logistics on Konga are carried out by Self fulfilment, KOS express (Konga owned), Courier Plus, QUO, EMS and DHL logistics. These logistics companies offer shipping services at negotiated special rates for Konga nationwide. For self fulfilment, you can offer free shipping for areas within your vicinity, this increases sales by 30%, or deliver at doorsteps. If you consider using KOS express, you have to take your order to a drop-off location and the customer pays the shipping costs. You are expected to ship orders no less than 3 days, visit your delivery settings on your dashboard for KOS express fees. In case of returns, indicate on your dashboard which KOS centre is closest to you. After successful delivery of the item to the customer, it is highlighted as ‘Delivery Confirmed’, if you have a return policy (usually 7-14 days, depending on your settings) the money is placed on escrow until it elapses, after that Konga collects commission and pays your quota into your KongaPay registered account after 1-3 business days. Konga launced this e-wallet to full effect in 2016, mandating all sellers on its platform to register for this service to enable instant payment for sales invoices, and 5% discount on purchased goods on the website. This is basically like registering for a bank account, quite simple and user friendly, select your bank, fill in your card details, BVN number, phone number, date of birth and generate your unique KongaPay pin. This is an advertising tool sold by Konga to improve your sales and visibility on their platform. This service ranges from N5000 to N17,500 per day.